Greek jazz scene has been increasing significantly the last 10 years, a new upcoming musical environment with high artistic potential has been developed in Greece. 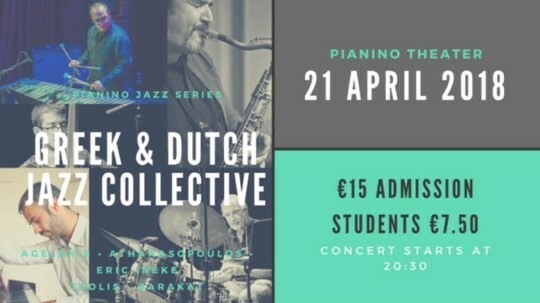 Many of the Greek jazz musicians have been studied in conservatories in the Netherlands and there are part now of the dutch as well the Greek jazz scene. The veteran Dutch Jazz drummer Eric Inece joins a line up with 3 Greek jazz musicians, Saxophonist Thanos Athanasopoulos, Pianist Georgios Tsolis and a Special Guest flying in from Greece vibraphone player: Dimitris Aggelakis. together with the Ecuadorian bassist Yussif Barakat there are going to make an exciting night full of swing.